Over the last year or so, we’ve documented just how right Adams has been about culture and electoral politics. 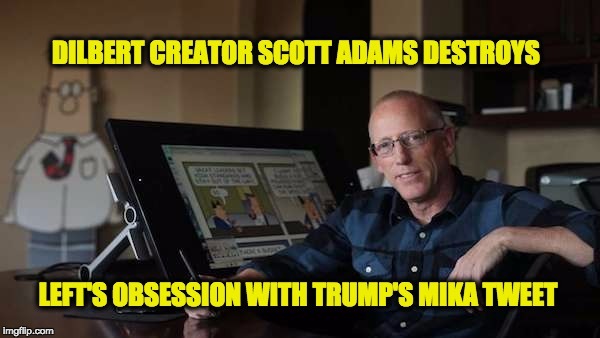 Dilbert Cartoonist Argues that Donald Trump is a Genius who will Win! You’ll Be Surprised at which Candidate this Celebrity says is a “Bully”! Now, in the wake of the recent tumult over President Trump’s tweets about MSNBC hosts Joe Scarborough and Mika Brzezinski, Adams is back to explain how Trump’s Tweets will destroy the world… and most Americans can’t take a joke. Here’s a link to my Periscope video explaining how President Trump’s mean tweets about Morning Joe will destroy everything you love. Wake up, people! It’s common sense! Tweets kill! On a totally unrelated topic, I have confirmed that 30% of the public can’t identify a joke without the help of a service animal. “First there’s the impact on the economy. It doesn’t look like it yet — the stock market is still very strong, consumer confidence is high, jobs are good. But I think you can see a tweet like this is going to cause people not to invest. Let’s say you were going to open a new coal mine, because the government had removed some regulations, the Trump administration did. You’re thinking this is looking good… and then this freakin’ tweet comes out. Oh my God, no way, who’s going to buy coal after this? Any economist will tell you it will just build up steam like a snowball down a hill. Later on Adams continued explaining Trump’s rhetorical genius by pointing out the true meaning behind the President’s recent tweet showing him wrestling CNN. As Adams explains, the video brilliantly accentuates Trump’s attacks on CNN by forcing us all to subconsciously associate CNN’s attacks on Trump with FAKE wrestling!